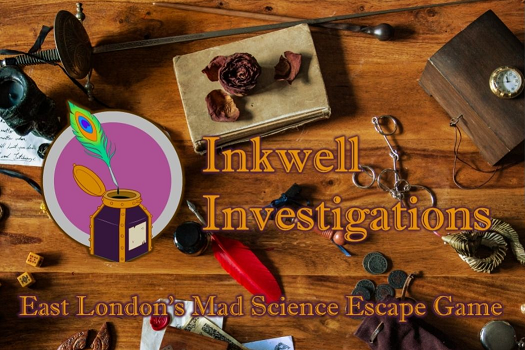 Murder History, from Inkwell Investigations, is an unusual “escape game” in that it can take place indoors or outdoors. I use the term “escape game” loosely because, even ignoring the indoors vs outdoors option, this most definitely isn’t a traditional game. Having opted for the indoor version due to a worryingly wet forecast, we headed to a pub near Mile End to find Professor Inkwell and begin our adventure. It’s a large enough pub to be able to play the game in a quiet corner but small enough that you’re not going to struggle to make contact, so we were soon sitting comfortably, drinks in hand and ready to begin. Except we’d made one small error: we’d mixed up the number of people coming and had one more than was expected. With most games, that’s no big deal, but here it’s critical. The game’s customised for the number of people who take part, so a last-minute addition or absence means either they have to rush a reset under pressure or the final murder mystery part won’t be quite as good. The ever enigmatic Lord Inkwell, rumoured to be both the Inkwell family’s founding father and the family’s last daughter, is infamous for having meddled excessively with Time, Space and Pudding, the three constants of the universe. Within the grounds of Inkwell Manor, yesterday has disconnected from tomorrow, Wednesday has broken up with Thursday and Sanity has engaged in a post-breakup doomed romance with the Ever-Sock (whence all lost socks are found). The Investigations are an attempt by the surviving members of the Family to bring order back to the universe, prevent the incursion of terrible beasts from the Neverwas and try and get “some blooming peace and quiet for once”, to quote Professor Inkwell. Yet we can’t do this on our own; only with the help of intrepid adventurers such as yourselves can we hope to fix the broken clock of Time, the shattered teacup of Space and the lazy susan of Pudding. Without any set to transport you to a new world, games like Murder History rely on a great introduction from the host to immerse you in the theme. The good news is that the Professor did well, setting the scene and throwing us back to a different era. Throughout the game, he hovered around, pushing the narrative forwards but also gently nudging us back on track if we had misinterpreted the clues. In fact, I suspect he usually plays a more active role from a cluing point of view, which gives him even more of a chance to build on that immersion. There’s an enjoyable – if slightly complex – story running through the experience that sees you investigating Lord Inkwell’s disappearance and unravelling a time paradox. It was nicely worked into the background and eventually came to the fore in the finale. At times, it was slightly distracting from the puzzle side of things but, if you trust your instincts, it’s usually pretty clear what the puzzle elements are, and you can choose to absorb as much or as little of the rest as you want. The nature of this game means that much of the focus has to be on the puzzles. At first glance, you may be a little disappointed as the props aren’t much to look at but, as you dive in, you realise that the game is incredibly efficient in its use of space. Plus, there’s a little bit of searching to be done that adds to your clue arsenal. That searching obviously varies significantly between the indoor and outdoor versions, with the latter allowing the searches to be more spread out, staggered through the game and directed. As it was, our search element was pretty much over a minute after the game had started. There’s a good variety and quantity of puzzling on offer that should appeal to pretty much everyone. At each stage there are at least three puzzles to be working on in parallel, so there is little sense of bottlenecking in the game. Inevitably, we’d get to a point where there was only one puzzle left, but that worked well to allow us to discuss what was, presumably, the most difficult puzzle in each set. Sometimes that was because it was most interesting one, but that wasn’t always the case – one puzzle had some ambiguity that required a bit of on-the-fly correction from the GM (who, to his credit, was paying close enough attention to swoop in and fix it), while another was a logic puzzle that I can imagine being a real struggle for some teams. There was even a physical one thrown into the mix, although I suspect that’s a ‘love it or hate it’ element. The game has a tendency to have you poring over laminate sheets rather than more elaborate props. That, combined with a lot of four-digit padlocks, did detract a little from the immersion, but both were understandable given the portable context of the experience. If that repeated use of four-digit locks is a red flag for you, don’t worry: the game has a lot of structure that means you’re never faced with many at the same time, and it’s always clear where to use the codes. We opened locks with certainty, not just hope. We “escaped” with around fifteen minutes remaining having taken a couple of clues, although we failed to identify the murderer. Clues are available from the GM, who’s in character and present throughout. It’s hard to compare this against other escape rooms because it’s such a different experience. There are clear escape room elements in the game, but there’s also a strong element of (logical!) murder mystery. If you don’t go in expecting a conventional escape room, I think you’ll have plenty of fun. It’s a well structured game with some fun puzzles and plenty of theatre. In fact, theatre is a pretty good description of this. Think of it as a boutique puzzle-themed immersive murder mystery experience. There’s plenty of story to absorb during the game, but it’s usually obvious which parts are important. This is one of those rare cases where both small and large teams can have a good experience. We went along with four but, if you’re enthusiasts and want to maximise the escape room puzzle fun, three would be best. On the other hand, if you’re happy immersing yourself in the story and murder mystery angle, I’d be happy suggesting up to six. With bigger teams, I’d recommend changing seats after each “stage” of the game to mix up who you’re solving puzzles with.